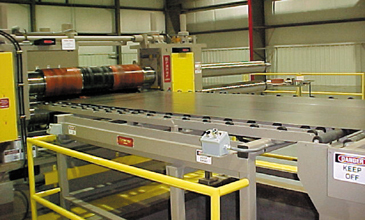 A massive 4-post computer controlled shape correction Hydraulic Leveler is employed to produce panel flat blanks and sheets. The Leveler is equipped with seventeen 1.500" diameter work rolls in a 5-Hi roll arrangement supported by nine back-up flights. The work rolls are positioned by 18-hydraulic cylinders (9-entry and 9-exit). Each cylinder is independently adjustable to provide precise roll positioning and roll bending necessary for the elimination of strip shape defects such as coil-set, center-buckle, and wavy-edges. A 2.80 GHz 40 GB HD computer precisely adjusts each cylinder via position data from linear voltage transducers installed in each cylinder. Work roll positioning is automatically accomplished based upon material thickness and yield strength data entered into the computer terminal by the operator. Work roll gap and roll bend adjustments can be made while running. A computer memory allows the operator to "save" work roll position parameters via job number for future recall, a time-saving feature when processing partial coil orders. The Leveler will automatically position the work rolls and back-ups to the exact roll gap and roll bend positions employed when the coil was previously run. Periodic Leveler "calibration" is automatically accomplished in 5-minutes without any tools. Braner/Loopco Levelers employ no reversing motors, screw jacks, sliding wedges, or tilting top frames to position the work rolls. As a result, work roll positioning is precise and maintenance is minimized. Multi-blank and side-trim slitting is accomplished by a quick-change 2-head precision Turret Head™ Slitter that allows Mi-Tech to prepare a tooling set-up while the line is in production. The ability to prepare a slitter set-up while the line is running offers a huge productivity advantage over multi-blank slitters that require the line be shut down while making a set-up. The Turret Head™ Slitter is equipped with a "pushbutton" tooling lock-up system that employs hydraulic cylinder powered tooling lock-up clamps instead of the common grease gun actuated threaded lock nut. The pushbutton system reduces set-up time and eliminates lock nut maintenance and worn arbor threads. As with all Turret Head™ Slitters, the slitter heads are exchanged in one-minute. While most multi-blanking lines are shut-down for 15-35 minutes preparing the next slitter set-up, the Mi-Tech slitter is set-up while the line is running. 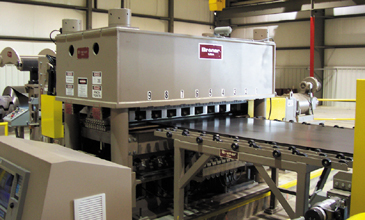 Once the set-up is completed, exchanging slitter heads takes one-minute. In order to complete a slitter set-up in the 30 minutes or so it takes to process a multi-blank order, the slitter is equipped with a tooling package designed specifically for multi-blanking. 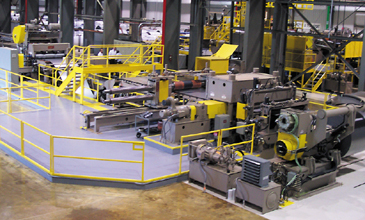 Unlike coil-to-coil slitting lines that commonly generate from 10 to 20 cuts as narrow as 1", multi-blanking lines typically produce from 2 to 4 strip multi-blanks wider than 5". The new multi-blank tooling package allows a 2 to 4 strip multi-blank set-up to be completed in 15-minutes by reducing the number of spacers used in a set-up.